The first thing to point out is the title: A Pastoral Symphony. 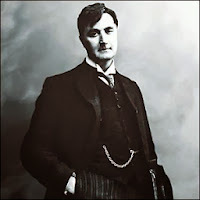 Why did Ralph Vaughan Williams call in this way the “symphony” dedicated to the World War of 1914-1918? At the war’s outbreak the musician, who was 41, enlisted as a private of the Royal Army Medical Corps. The theatre of his personal war was France. We find today poor notes about his war experience immediately after his return to civilian life but we know the composition of this symphony came to an end in summer of 1921. So we can assume that immediately after his comeback Vaughan Williams worked intensively to his particular “pastoral” sound. At this point we go back to the title that seems to deceive critics and commentators of the time (and of our time as well). No word about the Great War, no direct connection with it. But the scoring of this symphony, partially revised thirty years later, is fully dedicated to the war trauma and to the inner desolation of war. We know from some writings addressed to Ursula, his future wife, that this symphony was really “wartime music – a great deal of it incubated when I used to go up night after night with the ambulance wagon at Écoivres and we went up a steep hill and there was a wonderful Corot-like landscape in the sunset”. Vaughan Williams made the name of Corot. This is not secondary. So the link is not with “pastoral” iconography of Beethoven but rather with the French painter and his works of art. And maybe the atmosphere becomes closer to Debussy and Maurice Ravel (see also this post) than to any other typically triumphal war or battlefield sound of the time, full of trumpets and drums. As far as we know, with the Pastoral Symphony of Vaughan Williams we are in front of one of few symphonic compositions explicitly dedicated to the First World War and once again in this musical chapter of the Great War the perspective is an intimist one. But as you can guess, it does not make sense to spend other words on music, also because we are not critics. The only thing we can do now is to suggest to listen to it from Youtube or to find a recording (unless you have it already in your collection).